Campaigners against a high speed rail project have engaged in direct action across Italy. They have occupied nationally significant motorways, built barricades and set them on fire. Over the last two days that have battled with police and the armed forces, who have used, batons, teargas, water cannons, and bulldozers against activists. In other areas of the country there have been several occupations of squares and buildings in solidarity with the NO-TAV campaign. The campaign (NO TAV) against a high speed rail link between Turin and Lyon has been running for over twenty years. Throughout the campaign, protestors have occupied land, engaged in sabotage and many other forms of direct action. The Italian state has launched many attacks against the protestors in order to secure the land required for the rail project. One notable example was the eviction of a camp, and the arrest and subsequent prison sentences to twenty five activists who tried to prevent construction from taking place. •	Over 200 activists blocked a motorway interchange in Chianocco. •	Barricades have been built across a motorway in Salbertrand. •	Over 200 activists have occupied a railway station in Bergamo. •	Activists have occupied a square in Brescia. •	200 Activists have occupied and blocked the city centre in Naples. •	150 activists in Pisa marched to the town railways station and occupied the lines. •	Anonymous has hacked the website of the Italian police in solidarity. •	Activists occupied the ring road in Milan. •	No TAV activists in Palermo occupied the town’s railway lines. In Chianocco, demonstrators built huge barricades across the motorway before setting them on fire and fighting running battles with the police. Control of the motorway switched between the police and demonstrators on several occasions. The police used batons, teargas, water cannons, and fire engines in an attempt to disperse demonstrators. In Salbertland, a nationally significant motorway was occupied, barricaded, and set on fire. The police again used teargas and water cannons, and local soldiers in an attempt to regain control of the roads. “Police using water hydrants and smokescreens are attempting once again to remove the anti-High Speed Rail blockade on the A32 motorway and have deployed a significant number of officer and vehicles. There are a few hundred protesters opposing the police. The barricade is now on fire and the thick smoke can be seen from a distance. Messages have been posted on social networks trying to summon as many people as possible to the location which has been blocked for over 48 hours”. The following statement has been issued by activists currently occupying Bologna University. On February 27th, 2012, the State’s military apparatus attacked the Val di Susa people, expropriating and destroying their land with bulldozers and truncheons, in order to proceed with the mad project of TAV’s construction. Among the NO TAV activists who stand against the invasion was also Luca, a comrade whose land was expropriated by the industry CMC. Luca climbed an electricity pylon to block the advance of the bulldozers. In order to escape from the police climbers who wanted to take him down, Luca continued to climb up the pylon until an electric shock of 15.000 Volt hit him, throwing him on the ground. Despite the fact that help had been hindered for nearly an hour by cordons of riot police squad, Luca is now out of danger, although in very serious condition. But this is not enough to pacify the rage of our hearts! That pylon had to be cut off from electricity; the police knew so but did nothing, while Luca had been forced to climb higher. It was just a matter of coincidence that the State did not murder a comrade! It is, therefore, clear that the statements made some days ago by the police chief Manganelli, who made an invocation of death without many metaphors, are in fact a declaration of war against the Valley and all the people who resist. The area of the site has been declared a ‘strategic site of national interest’, meaning that apart from military presence, an unconditional use of violence is being legitimized. The residents and solidaritarians who were present responded immediately by occupying the highway near the site at several points, in order to prevent the access and the shift changes of cops and construction workers. 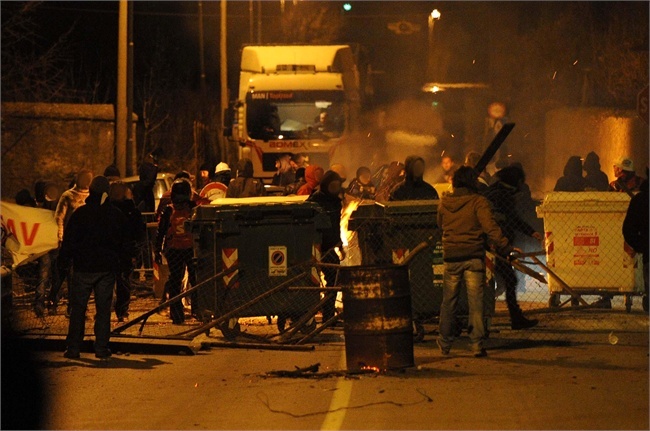 Since the first hours, solidarity actions were carried out in 26 more cities (now around 80), managing to create significant damage and disruption to the TAV traffic all around the peninsula. Furthermore, the solidaritarian attack has crossed the sectoral boundaries (in this case the transport sector), as in the case of the workers that went on strike in the very same morning. We are aware that the high speed line is crossing the country and that the NO TAV struggle isn’t limited in Val di Susa or in solely one project. So, we have occupied the faculty of Political Sciences of Bologna in solidarity with Luca and the NO TAV arrestees. We want to create an open space where we can discuss ideas and proposals against the advancement of this devastating works, and organize ourselves concretely also in this city. What's going on in that last video? I should have been clearer, sorry. Yeah, sorry, I guess it's edited not to show the point where he falls or the person filming missed it. The video jumped and ended quickly, was confusing. Hope he's okay, I think it said he's in a medically induced coma.